One excuse I hear all the time is that eating healthy is expensive. Well …. it just depends. If you continue to buy all the W30 (or after W30, but still Paleo) snacks and prepared goods, they are more expensive. But, if you learn to eat whole foods and make pantry staple items, it can be rather cost efficient. Buying a whole chicken, roasting it, eating all the different meat “cuts”, then using the leftover carcass to make chicken broth… you just got 1 or 2 family meals from a $20-$25 organic chicken plus the broth. SIDE NOTE: Organic vs. Conventional is a topic for a different day. Not EVERYTHING has to be organic. Another area to save a penny. Buy organic when is matters … like lettuce, strawberries, apples, meats. Buy conventional when it is less important …. banana’s, squash, avocado’s, etc. 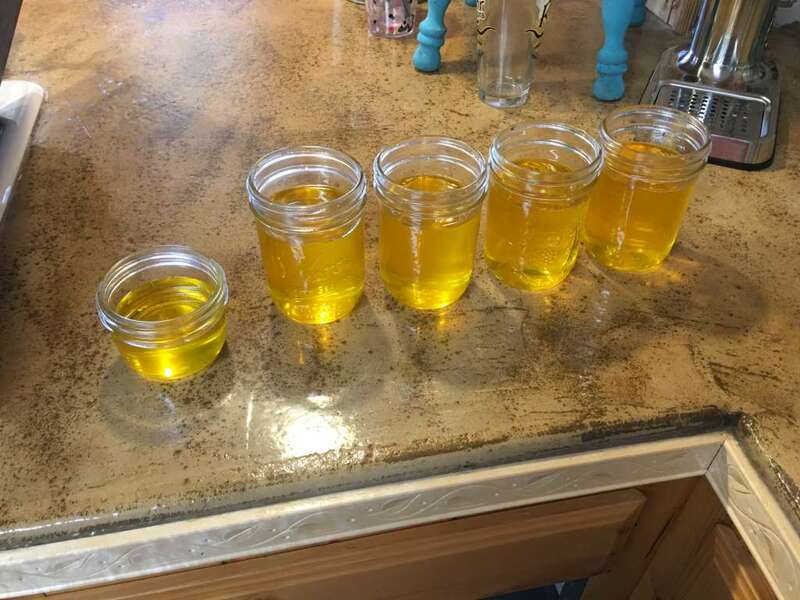 Back to making ghee …. this is a perfect example how to save a little money. Buying a jar of ghee from Walmart is $10 for 12 oz. Making ghee from Kerrygold Butter (some of the best butter around!!) cost $21 for 54 oz of finished ghee. THAT is cost efficient! Add all the butter in a large pot in a 250 degree OVEN for 1 hour. Coming out of the oven, the milk solids have separated and settled to the bottom of the pot. Robbo used a medium sized strainer, lined it with a paper coffee filter. Then, used a ladle to strain the butter into another large, clean pot. This physically separates out the milk solids. Robbo made a pretty big patch of ghee. This will last us for months! (or at least through Whole 30). Wide mouth mason jars are our favorite way to store this. You could store it in a butter crock. Or another glass ware. If you’ve removed all the milk solids and water, it is safe to leave it out on the counter (for up to 3 months; even longer in the fridge). This made about 54 oz. Ended up costing less than $0.40 / oz! I have been wanting to try this! Nice easy steps. This is awesome!